I don't know why I can't shake this card off, but in my opinion Guardian Seraph is really good. Not Baneslayer good, but good enough for competitive Magic. Yeah, I've been called crazy before, so it may just be me. But I don't play alot of White that is creature oriented, so it seems like I should care less. But it just keeps popping back up in my head that this is a tournament caliber card. Here's a link of the card for those who are more intellegent than myself and may have burned it out of their memories. To illustrate my point, let's just start with the Power/Toughness to Mana Cost ratio. You're getting a 3/4 for WW2. That's not good for a vanilla creature, but would you pay WW2 for a 3/4 FLYER? I would if it had some type of abilities. Blue is the master of flying, and it gets a vanilla 4/4 flyer for 5 mana (Air Elemental). And that's supposed to be the 'benchmark' used to formulate what a flyer should cost. They pushed this scale with Ethersworn Adjudicator, by giving this 4/4 Flyer two good abilities. They even relaxed the mana cost a bit by making it 1 Blue and 5 colorless, rather than 2 Blues and 3 colorless like Air Elemental. BUT. They did make Ethersworn Adjudicator a mythic rare, which justifies why it's so damn efficient. Now back to the Gaurdian Seraph. She's not mythic, but is rare. And we have seen the evidence of Wizards pushing the power level of creatures. I believe Gaurdian Seraph falls into the power creep category. A 3/4 Flyer for 4 mana is very good, even in today's aggressive standard. "If a source an opponent controls deals damage to you, prevent 1 of that damage." That is the clencher guys. Most Magic games are won by getting your opponent down to 0 life. That is the basis for the entire game: kill your opponent. And this creature is delaying that from happening for as long as it remains in play, all while providing you with a 3/4 Flying body. All 1/1's are now doing no damage to you. None. All Lightning Bolts are now Shocks. Your planeswalkers have a 1 damage buffer, essentially giving them "more loyalty"......and don't forget that 3/4 body can do quite a bit of blocking for those Planeswalkers. Blightnings are still good, but taking 2 damage is not 3 damage. It negates certain pump effects, like Honor of the Pure and Exalted. Her abilities stack, meaning that 2 in play prevents 2 damage prevented from each source. It's in a color that cares about it's own (like Honor of the Pure and Brave the Elements), meaning she will get more benefits in mono white builds. I also might add that White is probably the strongest stand alone color currently. I could go on, but seeing her in a deck would do more justice. Yeah seriously. What the hell is going on in that picture?? Is that a dude or a butchie-looking chick? Where are it's legs? Are they tucked under that "crab leg" skirt it's wearing. See, I don't even know whether to call it a dude or a chick, so for now it is an "It". And those wings.......do angel wings now come in "Snow Leopard Camo"? This picture has to be why this isn't seeing play, cause it's not a bad card.......just atrocious art. Nice thoughts. He does seem pretty good, but what kind of deck would he work well with? IMO he'd go good in anything with easy access to WW. I'd personally would like to see him alongside Honor of the Pure, making him a 4/5 flyer when it entered the battlefield. Some Planeswalkers alongside would be nice too. Yea, that sounds pretty strong. But, if you had to chose between Guardian and Captain of the Watch wouldn't Captain be better? With Honor the Pure you would have a 4/4 and 3 3/3. That is a 4 for 1 special. Maybe, they would both be good in the same deck? Change of topic. 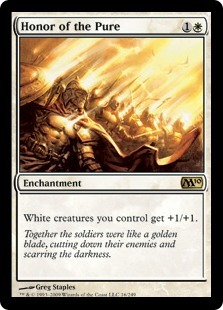 I thought World Wake might change which deck I play, but my Mono White Deck still seems strong. The only card I thought might hurt me a little is Chain Reaction because usually I get a 4 or more creatures into play. But, with Kor Firewalker and Brave the Elements I don't think I have to much to worry about. What R U thinking about playing this Friday.